Moderates in the Bush administration appear to have gained the upper hand over United States policy towards Iran. This emerged from evidence given to the Senate Foreign Relations Committee by Richard Armitage, the deputy secretary of state, who said that Washington was ready to re-open limited talks with Iran. Detente between Iran and the US? He was also asked if the US policy sought regime change and answered: "No, sir." "It is not up to the United States to choose Iran's future," he said, adding: "We are prepared to engage in limited discussions with the government of Iran about areas of mutual interest." These talks, he stressed, would not be about re-establishing diplomatic relations, which were broken off after the Islamic revolution in 1979. However, a condition for the talks is that Iran should share intelligence about al-Qaeda suspects they are holding. Iranian Government spokesman Abdullah Ramazanzadeh set out Iran's own terms, which were firstly that the US "should stop accusing us". "They have levelled false accusations against us one too many times," he said, referring presumably to American accusations that Iran is part of an "axis of evil" and has supported international terrorism. He said that Iran could not give information to the US about the al-Qaeda suspects because "we don't have any relations with the United States or its security services". Behind the harsh words, which include an accusation from President George W Bush that Iran is lax in policing its border with Iraq, lies a softer policy on both sides. 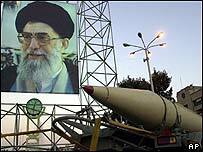 Iran, for example, says it is ready to accept stricter inspections on its nuclear programme. Mr Armitage and his boss Colin Powell seem to have fought off the hardliners who want a more confrontational policy. In his evidence, Mr Armitage himself referred to the arguments within the administration and Congress. "United States policy is to support the Iranian people in their aspirations for a democratic, prosperous country that is a trusted member of the international community," he said. "Given the complexities of the situation," he went on, "it is no surprise that there is a range of views about how best to implement that policy." The moderates believe that change in Iran can come from within. They have been encouraged, for one thing, by the welcome given to Shirin Ebadi when she returned to Tehran after winning the Nobel Peace Prize. "Ultimately I am most hopeful for (Iran's) future because it is the people of Iran themselves who are providing the key impetus for change," said Mr Armitage. Ranged against such arguments is the case made by the neo-conservative lobbyists in Washington. "The Iranian tyrants are the keystone of the terror network. Far more than the overthrow of Saddam Hussein, the defeat of the mullahcracy and the triumph of freedom in Tehran would be a truly historic event and an enormous blow to the terrorists." Mr Ledeen is not in the administration but he is closely connected with figures like Richard Perle and is a resident scholar at the home of the neo-cons, the American Enterprise Institute. Such hostility towards Iran is mirrored by suspicion among Iranians, even moderates, towards the US. A senior Iranian diplomat, briefing reporters in London, spoke of the "blind hatred" of the US towards Iran. He stressed that Iran intended to continue with its programme to enrich uranium for nuclear power after the pause promised to the International Atomic Energy Agency while the stricter inspections are negotiated. His justification for continuing the programme, that Iran could trust nobody, spoke volumes about Iran's resentment towards outsiders. Its nuclear power plan had started in the Shah's era, he said, but it had been constantly let down by outside suppliers. And this could not be allowed to happen again. The diplomat also attacked the US for looking at the Middle East through a "pro Israeli channel". Iran has a particular view of things itself sometimes. Its Foreign Minister Kamal Kharazi said that "the attack against the International Committee of the Red Cross (in Baghdad) was launched by those who want the occupation forces to stay in Iraq". That is a view which few others will hold. With suspicions on both sides, even the limited talks proposed by Mr Armitage will be hard going.